Lingual orthodontics basically means fixed braces for the back of the teeth, making them less visible when fitted. 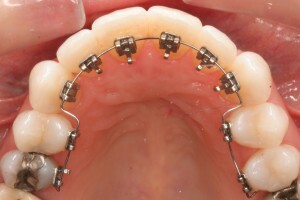 The lingual brace works in exactly the same way as a traditional brace, just in a different position. This treatment is suitable for correcting the position and bite of both the upper and lower jaws. The treatment process will begin with a consultation. This will involve taking impressions and photos to give the dentist as much information as possible to plan the treatment necessary. The dentist can then examine the case in more detail to ensure the patient is a suitable candidate and we can achieve the desired result. The consultation also gives the patient the opportunity to ask any questions and gain a real understanding for everything that is involved working with the dentist to agree the best treatment options. The molds that have been taken are then used to custom make the lingual device, this is fitted in a second appointment in which the dentist will also discuss and demonstrate how to clean the brace efficiently. Cleaning can be slightly trickier than a traditionally placed brace but with practice there is no reason why good oral hygiene cannot be maintained. From here the memory wire will be changed at intervals as the alignment progresses, these appointments can be combined with reviews to check progress and make any adjustments if necessary. After the teeth have reached their final position the treatment is complete. Lingual Braces are an ideal solution for patients who are slightly more image conscious, the positioning makes them barely noticeable however the technology is very closely linked to traditional braces providing superb control over tooth movement. However they can take slightly longer to get used to as are in close proximity with the tongue. Lingual orthodontics are suited to all types of malocclusion, however may not be suitable in extremely complicated cases as the brackets may be under more pressure from biting or because there is simply less space on the back of the teeth. Although it is suggested treatment can take slightly longer with Lingual braces there is still quite a large range from 6 months to 2 years depending on the complexity of each case. Also sometimes patients will delay starting orthodontic treatment as they have a special event coming up, with lingual braces there is no need as they are virtually invisible. For more information please feel free to Contact Brighton Implant Clinic or Call us at 0800 111 6623.